Sunnysyrup Food Co., Ltd. is a professional manufacturer, supplier and exporter of Green Apple Boba with over years experience. The products made by us are high quality with competitive price and always delivered on time. We have new products every month to attract new customers. We have gained the reputation from more than 300 buyers throughout the world. Customization is welcome. We have been awarded the good export record in Taiwan every year. Please contact us right now. Find more information, please visit our website. We are looking forward to have a long term business relationship with any of our customers. 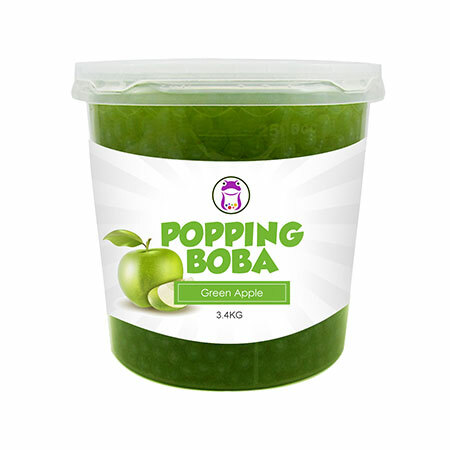 Popping Boba-Green Apple Flavor Coating Juice is light-green color, with bright and smooth surface. When biting the boba, green apple juice is flowing out into your mouth. Sweet green apple juice makes various kinds of tea appreciation. Regardless of extract tea or fruity tea, adding Popping Boba-Green Apple Flavor Coating Juice could be perfect fusion. Popping Boba series include various kinds of juices coated within a sea-weed-made skin, once chew on, it bursts rapidly and release the refreshing smell of juice inside your month, lifting the spirits and with lasting aftertaste. Green apple coating juice is made of Green apple juice, suitable for various of drinks and as topping for frozen yogurt.